ALL BUILDING SITES HAVE ACCESS TO FREE SOLAR ENERGY. MAKE THE MOST OF YOUR FREE ENERGY WITH SIMPLE YET ELEGANT DESIGN CHOICES! Properly shaded south-facing windows and a well-insulated, air-sealed energy envelope help create a passive solar home that can almost heat and cool itself. Although simple in concept, it takes experience to combine all of the elements into a home design you love, that fits your site, and is built to keep you safe, comfortable and healthy. We're ready to help! A passive solar home collects winter heat from the sun through south-facing windows and stores it in dense materials that release it slowly at night. Windows should face within 30 degrees of true south and receive full sun in the winter for maximum heat collection. During warmer months, windows need exterior shading to prevent too much heat gain. Shading comes from properly-sized overhangs, awnings, trellises and/or operable insulated shutters. It can also come from landscaping. Concrete, tile, brick, and stone are all good materials for storing collected solar heat during cold months. 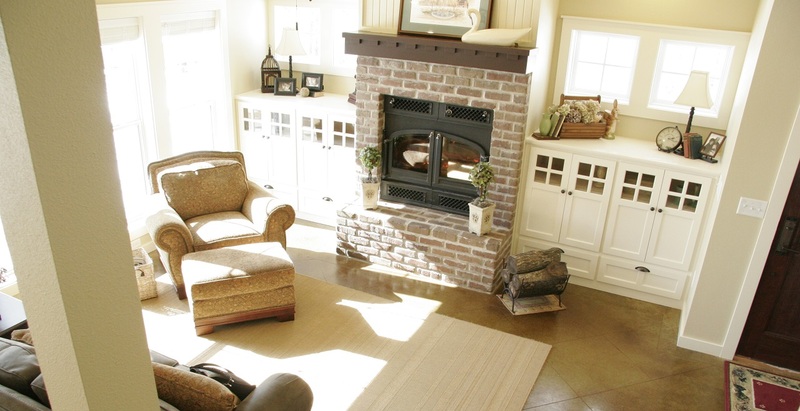 These materials are referred to as thermal mass and are often used as flooring or as fireplace surrounds. In moderate climates, furniture, drywall, appliances and cabinets can often provide enough thermal mass by themselves for storing heat. Moving stored heat to different parts of your home can be handled by natural air flow and/or fans in the winter. In warmer months, opening a skylight and lower level windows creates flow-through ventilation to cool your home at night. An experienced passive solar home designer knows what works best with your home's design. Your home's energy envelope consists of its foundation, walls, roof, insulation, air sealing materials, windows, and doors—everything that separates you from the outside air. A well-insulated, air-sealed shell keeps your home free of drafts and cold and hot spots. It makes a passive solar home possible. Call or email us today to begin designing your own passive solar custom home!